"HI." 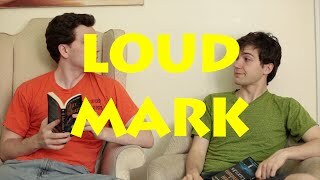 That's all that's said in episode one of the 31 part epic Web Series "Loud Mark" produced by Kingmaker Sketch in 2014. It's an experiment in sketch comedy minimalism, where the joke is spelled out to the audience in the name of the series. Each episode features Mark, a man who is jarringly loud and only speaks in short phrases, and Dan, his roommate who speaks at a normal volume. The series, which was released one episode a day for the month of July in 2014, appears to be one note at first, but gradually transforms into a more complex exploration of a man burdened by his own volume. Kingmaker also attempts to bend the form as the episodes progress. "We were experimenting with anti-comedy and minimalism at the time," said Mark Vigeant, the Famous New York-based Comedian who plays Loud Mark. "I'm naturally very loud as it is, so the idea of taking my audio and turning it up as loud as I could was prepostrous. Once we thought of that we knew we needed to do it." As with any piece of art that is devoid of cultural or timely references, this Web Series is worth watching at any time with any age group. "We saw other people making really high-quality stuff that wouldn't make sense a week later," said Mr. Vigeant. " So we decided to make some lower quality stuff that would last forever."